Almost everyone watches movies nowadays. What better way than share your opinions and get recommendations than to have a whole thread dedicated to Film Reviews! To keep everything somewhat uniformed, I've created a template to help out. Within the last few years of my life, I've watched plenty of movies with gay protagonists. Movies like Moonlight and Call Me By Your Name took my breath away, GBF was downright offensive, Weekend & Brokeback Mountain broke my heart. Love, Simon gets placed in a category that none of the other films could: A Soft Rom-Com. This movie hit so many things so perfectly. It captured what it's like being in the closet so brilliantly. As well as the heartache of what it's like to love someone but not feel ready to confess to them because of the secret you've grown so accustomed to keeping. There's laugh out loud moments, moments that'll make you cheer with pride, heartwrenching moments, and some of a perfect amount of sheer beauty. I've used the word beautiful a lot in this, because that's the best way to describe this movie. I can tell that this movie is going to help a lot of younger teens that are still trying to figure out they're sexuality. It might be one of the most special things about it! It's literal history in the making. I wish i could turn back time and show this to my 14 year old self. How did you watch Love, Simon @Drewbby? I didn't think it was out yet. Yaas, i will legit be the only person using this thread but this is awesome! I posted a status just the other day about doing film reviews - Maybe one day we could get a dedicated subforum in cop critic or something. I'll be sure to post soon! Wow! I am jealous! I read the book it is based off and I related so much to Simon and Blue. For my first review on COP i am going to be starting off with one of, if not the best movies of 2017, The Florida Project. Directed by acclaimed director Sean Baker. It is a beautiful representation of the struggles of the 'invisible homeless' living in holiday motels in Florida just outside Disney (Fun fact: Disney's codename before being built in Florida was The Florida Project) This movie is a love letter to childhood and will make you laugh and cry (omg the tears) I'm not going to spoil anymore of the story because simply everyone needs to watch this film. The acting is superb and stars Willem Dafoe in his best performance ever in my opinion. This movie was completely snubbed by the Academy this year and should've easily picked up a nomination for Best Picture and Director. Do yourself a favor and watch this movie. It is honestly my favorite movie of all time. For my first review on COP i am going to be starting off with one of, if not the best movies of 2017, The Florida Project. 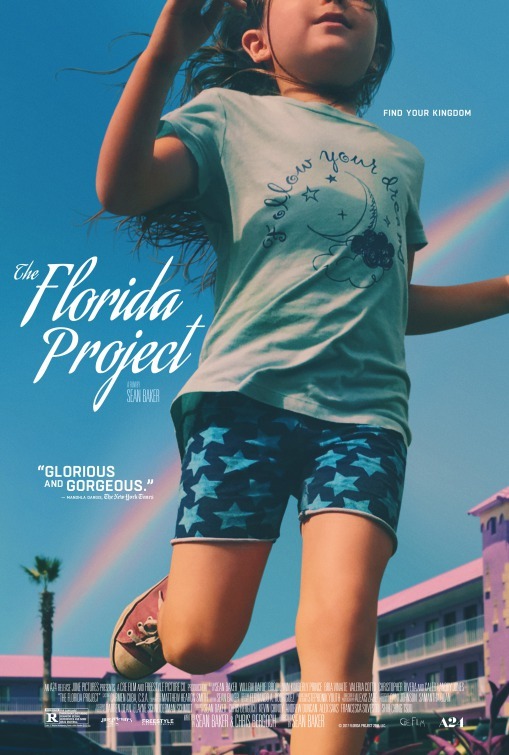 Directed by acclaimed director Sean Baker It is a beautiful representation of the struggles of the 'invisible homeless' living in holiday motels in Florida just outside Disney (Fun fact: Disney's codename before being built in Florida was The Florida Project) The story follows Moonee a young girl and her mother Halley. I'm not going to spoil anymore of the story because simply everyone needs to watch this film. The acting is superb and stars Willem Dafoe in his best performance ever in my opinion. This movie was completely snubbed by the Academy this year and should've easily picked up a nomination for Best Picture and Director. Do yourself a favor and watch this movie. It is honestly my favorite movie of all time. I literally went to four different stores this morning looking for the blu-ray of this movie, only to find out that the Best Buy by my work has it. I'm picking it up after work tomorrow and I'm beyond excited. It's one of the last movies I need to watch before the Oscars this year! You convinced me to give this a chance, I knew nothing about it till now but it sounds great! omgomgomgomgomgomogmogmogmogmogmgog please tell me how you liked it if you watch it! so far best horror of 2018, what's gonna beat it? @barbiej33p i had literally never heard of this movie, but after this I am DEFINITELY going to check out. I absolutely love horror movies & I'm actually disappointed in myself for not knowing about this movie. This is a fantastic review by the way! This is the most recent movie I've seen in theatres so I am giving my thoughts. Lady Bird is the story of a girl named Christine who prefers to be called by "Lady Bird" and the relationships she has with her family and other students at the Catholic School she attends. The acting in this movie is fantastic. Saoirse Ronan somehow seems like an actual teenager and not an adult pretending to be one. Laurie Metcalf is very believable as the mother who is struggling financially and with raising her children. The screenplay is also a highlight and some of the lines hit your funny bone or heart strings. There are several emotional moments that make you feel sad but I can't say because spoilers. I do wish the movie had a bit more plot or had something that held the movie together more as a few scenes felt a bit abrupt. However it still mostly it works. Yes! It could have been a bit longer. It was only 90 minutes so it had room to add a few more scenes. Ugh. What a great movie, i loved the pacing and the length of the film was perfect.